China Trade Institute ("CTI") is the world's most advanced portal for disseminating information regarding entrepreneurial and investment opportunities coming from China to the U.S., and the rest of the world. 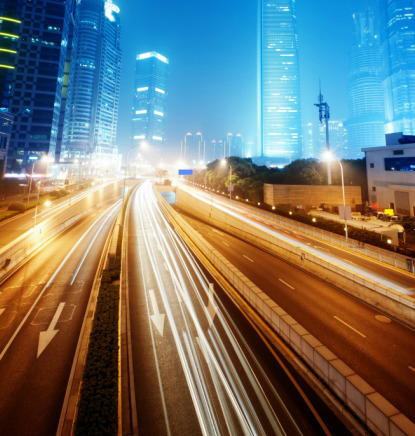 CTI offers sophisticated, focused materials for business professionals who wish to participate, in one aspect or another, in the Chinese economic phenomenon. China Trade Institute facilitates interaction and helps consummate transactions among parties with common interests in the China business landscape. In addition to providing comprehensive training, the Institute faculty, made up of experts on China affairs and business development from around the world, is available for private consulting in many aspects of doing business with China. China Trade Institute’s faculty and advisory staff is well versed in both inbound and outbound Chinese foreign direct investment, importing and exporting from China, outsourcing of labor, manufacturing relocation, doing business with China's economic zones, venture capital opportunities, and other legal, accounting, and cultural aspects that drive successful interaction with the Chinese economic machine. Periodically, the institute will hold conferences and webinars in China as well as in the mainland United States, Europe, and Asia. 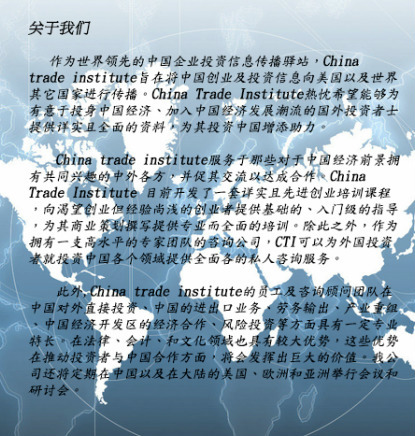 China Trade Institute is committed to the mutual friendship of China and the United States and to the synergistic cooperation of the west and the east with socially and environmentally responsible investors and business interests from Africa, Latin America, Europe, the Middle East, Russia, India, and Australia.